This article discusses hidden compartments found in antique furniture pieces, especially desks and secretaries, and describes some examples with multiple secret compartments. It originally appeared in the November 1939 issue of American Collector magazine, a publication which ran from 1933-1948 and served antique collectors and dealers. Secret compartments for money, securities, ancestral jewelry and silver plate, a missing will, or a carefully written confession of a crime committed years before, have served fiction writers well. In fact, so well, that they are apt to be considered as just literary props, something to sustain a tale and maintain necessary suspense. Today, sensible people keep their current funds in banks and their stocks and bonds and the like in safe-deposit boxes. But these have only been in existence since the turn of the 19th Century. Before that, the man of property secured his movable possessions against thieves as best he could in strong boxes and cleverly concealed places of hiding in furniture and behind secret panels that, like the modern safe combination, baffled the outsider. ILLUSTRATION I: An 18th-Century American Secretary: This shows the interior in place. The central cabinet can be removed and hides four drawers and two document boxes. Of course, it is Poe’s master detective, C. Auguste Dupin, who eventually finds the missing letter and gets the reward of 50,000 francs. But the details of the story are beside the point. The sweeping statement of the Prefect regarding the stupidity of anyone who fails to find a secret drawer shows that he knew little about these ingenious evidences of the cabinetmaker’s skill. I know of a collector who owned a piece of furniture for several years before finding that it even had a secret compartment. Many a piece has yielded up its hidden caches only when sent to a cabinetmaker for thorough reconditioning. Some pieces have a single secret; others have a score. Sometime ago I spent an entire afternoon trying to locate the secret compartments in an American secretary that looked quite innocent of any. At the end, the owner came to my rescue and pointed out several that I had missed. There were twenty-one in this simple slant-top desk. Some were large enough for several letters; others were so small that only a coin or two, or possibly a half-dozen pieces of Continental currency folded in half, could be accommodated. ILLUSTRATION II: The Hiding Places Revealed: The interior of this secretary. At the left is the central cabinet that has been removed. The door is partly open, showing its pigeonholes and drawer. The pilasters on both sides are firm. In the interior are shown the pair of document boxes and four small drawers concealed behind the cabinet. In fact, I often wonder whether the original owners knew of all the secret compartments in their pieces, or if they did know, how much they used them. For contrary to fiction, I have yet to hear of a secret compartment in any piece of antique furniture that has yielded anything of real value or even of much interest. 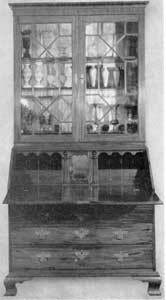 ILLUSTRATION III: A Sideboard with Concealed Space: The deep drawer at the right has been pulled out to show the false back and additional space behind it. This might readily go unnoticed and provided a good hiding place for pieces of silver. However, the old cabinetmakers were practical men and probably did not waste their skill on useless details. So we may assume that the owners of pieces with secret compartments used the latter for hiding certain valuables and in time passed on the knowledge to the next of kin. Today, it is the hope that something of more interest than a paid bill may have been forgotten or overlooked in one of these caches that adds zest to antique furniture collecting. ILLUSTRATION IV: Fifteen Secret Places: This is the interior of the New England Queen Anne desk illustrated on the cover. The central section has been removed to show the pocket concealed at the back. In the foreground are two of the secret drawers. At the back can be seen an additional document box that slides behind the pigeonholes on that side. Beneath the central section can be seen the well that occupies the space of the large false drawer. Access is through the sliding panel built into the writing surface, which has been pushed back. 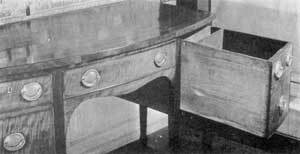 With English and American furniture, the pieces most liable to contain secret compartments are desks and secretaries. Next are the chests; then come sideboards, highboys and chests on chests. Concealed drawers may also be found in tables, particularly of the card table type, where a swinging leg supports the upper half of the top when it is folded back. Traveling desks and small boxes sometimes have their secret compartments, usually in the form of false bottoms. Just how early English and French cabinetmakers began to turn their attention to adding these hiding places to the furniture they made is a question, but I do not think it began until after the Italian furniture influence reached them, coming either directly or via France or the Low Countries. Secret compartments appealed to the Italian temperament and they made many cabinets, small and large, with hidden drawers and the like. These date from the late 16th or 17th Centuries. ILLUSTRATION V: A Pennsylvania Painted Chest: The right end, that is movable, has been raised to show the drawers concealed in the false bottom. These are arranged as they fit into the space in front of this miniature chest. One of polished bone (Illustration VII) is typical of Italian work. In the center of the interior is a small door flanked by classical pilasters. Behind it is a little compartment, removable if pressed carefully, and back of that two tiers of four very small drawers. This design presents the arrangement found in interiors of English and American desks of the 18th and early 19th-Century workmanship. American cabinetmakers do not seem to have built secret places into their furniture much before the advent of the Queen Anne period, although I have heard rumors of such pieces in the William and Mary style. But from about 1720 through the Sheraton years, secret places were much in vogue. The desk was, of course, the favorite for such features. Here the owner wrote and transacted his business and here his money and papers could be put away. As stated before, this Italian design inspired the central section of the interior (Illustration I) as the most logical position for concealed compartments. This might be a small closet or a grouping of pigeonholes and small drawers with or without a front (Illustration II). Such a section is an inch or two shallower than the pigeonholes and drawers on either side. It pulls out as a unit but is held firmly in place by slots of wood that slide sidewise and are usually concealed in the top or by some sort of wooden spring that must be pressed to release the section. The trick is to find it. The best way is to examine the interior by the Braille method in order to find a slight depression for a fingertip. This gives the needed hold for operating either slots or spring. ILLUSTRATION VI: A Queen Anne Flat-Top Highboy: The drawer concealed behind the cornice molding has been opened to show its size and location. When this central section is released and pulled out behind it, either as part of the section itself or built into the available space, will be tiers of small drawers and sometimes narrow but deep pockets of the right proportions for letters or folded documents (Illustration II). Also beneath the central section will be found another thin pocket of wood with its opening toward the rear which can be raised with one’s fingernail or the point of a knife. The second most usual location for secret places is behind the half-column pilasters flanking the central section. Attached to the back of these architectural ornaments are the “document drawers.” These are nearly the full height of the desk interior and practically as deep as the space extending to the back boards of the piece. Wooden spring catches hold them in place and access to these catches is usually by way of round holes, about three-quarters of an inch in diameter, in the upright partitions at either side of the central section. But document boxes of this type became too common. In some desks and secretaries, one finds the pilasters made as an integral part of the removable central section. Then such document boxes, behind them and separate from the pilasters, were available only after the central section had been released. Other places of hiding were small shallow drawers concealed behind the arched trim at the top of the regular pigeonholes. 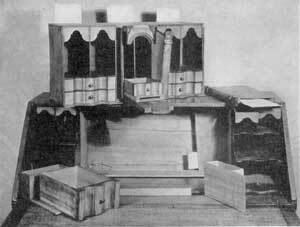 When there was an arrangement of small drawers beneath, some of which were not of full depth, behind them were secret ones, which could be reached only after the front ones had been removed (Illustration IV). ILLUSTRATION VII: A 17th-Century Italian Cabinet: Made of polished bone and decorated with miniature landscapes the door in the center, flanked by column pilasters, is the same design used in English and American desk interiors of the 18th and early 19th Centuries. When this central door is opened it discloses a compartment with a false back, behind which is a double tier of small drawers. At other times one finds additional document boxes concealed behind the pigeonholes which slide sidewise after the central cabinet has been removed. An example of this arrangement (Illustration IV) has such a box on the right and in the base of it is a second concealed pocket that is only found if the box is removed and the outer side studied carefully. The desk that has this feature also is provided with a most ingenious set of hiding places that take the place of the first large drawer beneath the level of the writing top. 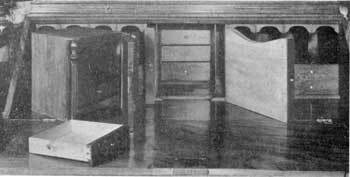 Outwardly false, there is a sliding panel immediately below the central cabinet which gives access to a well such as is frequently found in desks of the William and Mary period. At the front is a series of three hidden drawers without knobs that are released by using the fingernails along the upright cracks that separate them. At the back of the well is a hiding spot the full width of the desk interior which is concealed by a thin panel that moves forward when the central cabinet has been taken out. This unusual Queen Anne desk of curly maple, made in New England about 1750, has no less than sixteen secret compartments. The craftsman who designed and made it must have had real inventive ability for these hiding places are so skillfully executed on one-eighth-inch pine that one has to be an antiquarian detective to locate them. For instance, the back of the central cabinet is false and the upper board neatly dovetailed in place; but if pressed slightly, it moves sidewise and the board is released. Behind it one sees three pockets about a half inch from front to back. ILLUSTRATON VIII: An English Washstand: Here the ball-shaped finial is in two parts and is hollow. Beneath this are two small triangular drawers that would readily go unnoticed. These features were excellent hiding places for jewelry. Another desk, that on casual inspection gave no indication of a secret compartment, yielded one of the most ingenious hiding places that I have ever seen. The sliding brackets on which the slant top rested when open were of the usual thickness and height, an inch by three and one-half, but one of them had a secret place. If the first large drawer in the lower part was taken out, the pin that stopped the slide when pulled forward could be removed. Then the slide itself could be taken out and on the underside toward the rear was inset a small pocket just large enough to hold a half-dozen pieces of Continental currency when folded in half. Who would suspect so unassuming a country-made desk of having a hiding place. Yet there it was to prove what some cabinetmaker could do for a customer who wanted such security. Next to desks, secret places are more frequently found in the bracket-footed chests in which linens, blankets, and clothing were stored. The most intricate have an end that slides up giving access to the drawers concealed in the false bottom (Illustration V). Because of the bulk of such a piece and the shallowness of the concealed drawers, this false bottom could readily pass unobserved. Chests with secret drawers of this sort were made in both full size and miniatures. They were especially popular with the Pennsylvania-German cabinetmakers. Their painted decorations also helped to conceal the fact that one end was movable. 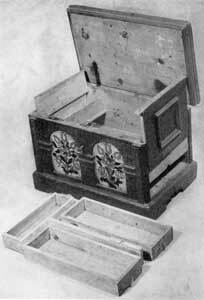 In other chests where a small covered box or “till” was built into them, usually at the upper left-hand end, the inner side of the till was frequently movable. It slid upward when the top was raised to give access to two or three small drawers concealed in a false bottom. 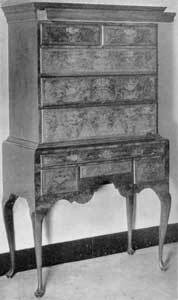 The highboy is another piece of furniture that frequently possessed a secret compartment. 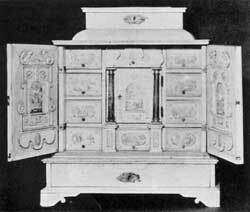 The flat-top highboy of the sort made during the William and Mary, Queen Anne, and Early Georgian periods, with a broad cornice molding, was sometimes constructed with a shallow drawer, the width of the piece, concealed behind this cornice molding (Illustration VI) . It was without handles and hidden in the false top of the piece. One or two pieces of this type that I have examined have a wooden spring catch that locks the drawer and can only be released by removing the drawer below. When such highboys were new, the cornice molding and the drawer behind it fitted so closely that there was no indication that a drawer was concealed behind it. Later as the sides or runs of these drawers wore, through use, the molding front had a tendency to sag slightly, thus giving a clue to what was hidden behind it. many years ago I used a writing desk at a boarding school that had a hidden compartment under the desk top. It was quite a nice desk and was auctioned off when the school closed down and the property sold. I was wondering if anyone has seen this type of desk. I would love to try to acquire one for my home. my friend has a sherton chest of drawers inherited from her mother with a hidden compartment. she, however did not pay attention when her mother showed her how to open it. her mother passed away and she still does not know how to get into it. there is a long flip type latch under the top left drawer, but we do not know what piece should be exposed. maybe you know some one with a similar piece. Dee, I suspect you meant Secretary Alexander Hamilton, as that was the highest station he gained. Hamilton was never president. a bird, flowers highlighted in gold, and the titles on the are written in chinese. I discovered a petite side table yesterday at a local thrift store. It is obviously hand, rather than machine crafted, with three very small drawers across the front. The top overlaps the sides by about an inch. After trying unsuccessfully to open the top drawer, assuming it was broken somehow, I picked the table up, unintentionally tipping it a bit to the left, and a hidden drawer slid out of the left side, almost smashing onto the floor. That had obviously happened before as the secret drawer was damaged across the bottom. I am wondering in what era and where this might have been made. I just bought an old desk made from quarter sawed white oak it has a 2 1/2 inch hole on the top of the desk on each side that is behind the desk drawers it gives access to a plunger with a spring on the bottom, it pushes up and down but I have no idea what is for with the drawers removed I can see that these plungers aren’t connected to anything. Do you think this desk worth restoring every glue joint is loose and will have to be compleatly disassembled to restore? I will do the restoring myself. What can you tell me about the age of this desk from the information I have given you I was told that it is from England. I have my mothers secretary desk. She once showed me a secret compartment and I had forgotton about it until recently, There are 2 holes, one each side when you open or remove the top drawer. Seems similar to device described by Lynn Wilkins. There were 2 devices about 2 inches long. one end went in the hole, the other end was pushed in to secure it. There was a small metal part that had to be down when the device was inserted. Starting on the left, it was turned forward until you heard a click. then repeat the same process the other side. A hidden draw then popped forward. It was between the top drawer and the desk lid. When the plungers were removed the draw could be slid back. I remember commenting at the time that if you didn’t know it was there you would never find it. the devices are lost and I would love to hear from anyone who has anything similar. I posted a request to help me locate a family heirloom desk on collectors weekly website in 2010. Unfortunately, I did not see the reply until today. It is now 2016. Shanon Miller replied, that someone said they may have the desk. Shanons email at zip auction is no longer active. I am posting my request again hoping someone can help me locate the desk. My email is deewayland@gmail.com. William Duer, my ancestor,asst. sec/treas under Alexander Hamilton owned the desk. It was sold at auction w/provenance about 1986 in Ct, and again at auction in NY. A few years later. It’s a curly walnut Chippendale, with secret compartments. Please let me know by email if you can help me. Thank you. I bought a Chippendale Secretary with a book case a few years ago. It is 92 inches tall. I was doing some research on that type of secretary. Mentioned in the article was some info about 7 secret drawers. I almost broke my neck going to look in my chest. Sure enough all 7 little drawers were still there. The article mentioned that usually one or two of the little drawers usually become lost over the years. I’m really attached to my secretary!!! I bought a sideboard made by William kimp furniture co. Grand Rapids Mich. It came with a the original info saying its from 1820-1830 .” The feather and pineapple carvings and twist columns are very characteristic of this period. There is a secret compartment in the case.” I can’t find it please tell me if you have any idea of where it is! Thank you Wilamina. i have an old roll top when i pull the top down it will not go back up seems to be hitting something ?? ?